I love my city and I’m always happy to share my love with friends and family, and really anyone who will listen. No city is perfect, of course, and there are some things I’d like to see change in the next few years. But the things I love far outnumber the things I don’t love. I will find any number of reasons for someone to visit Chattanooga. In honor of my third anniversary of being a Chattanoogan, I thought I’d share some of my favorite reasons. 36, if you will, for 36 months. 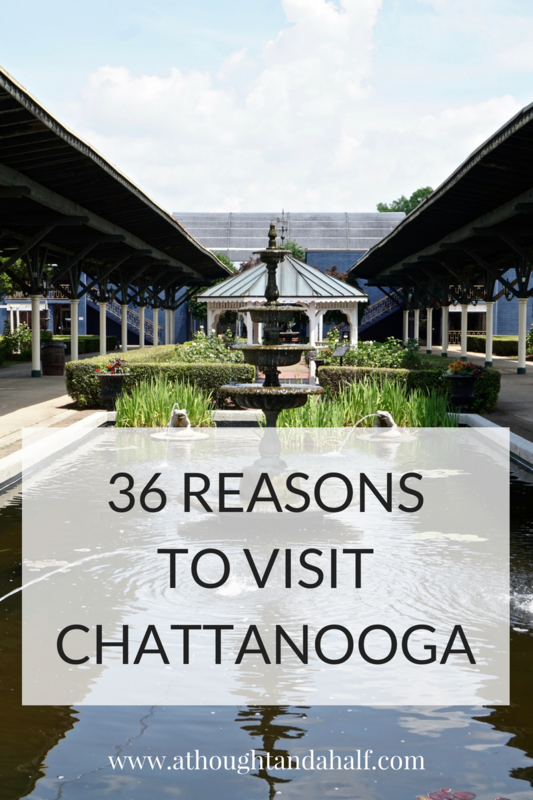 Here are 36 wonderful reasons to visit Chattanooga, TN! I’m sure I could think of more, but these are a good start. The mountains and scenery. They don’t call it the Scenic City for nothing! Driving through town on I-24 or highway 27, you’ll see three mountains right there in all their glory. Lookout and Signal mountains are home to some of the best hiking trails in the state. You can drive a little further out, even into North Georgia and Alabama, and discover even more great hiking. The Tennessee River (and its surrounding creeks and lakes). There’s a ton of water to play in around here. I’m personally a fan of paddle boarding on the river. If swimming holes are more your style, we’ve got plenty of those, too. Brunch. Brunch is serious business in Chattanooga. It’s a mimosa-filled social event in itself. We’ve got a whole host of fabulous places for brunch. 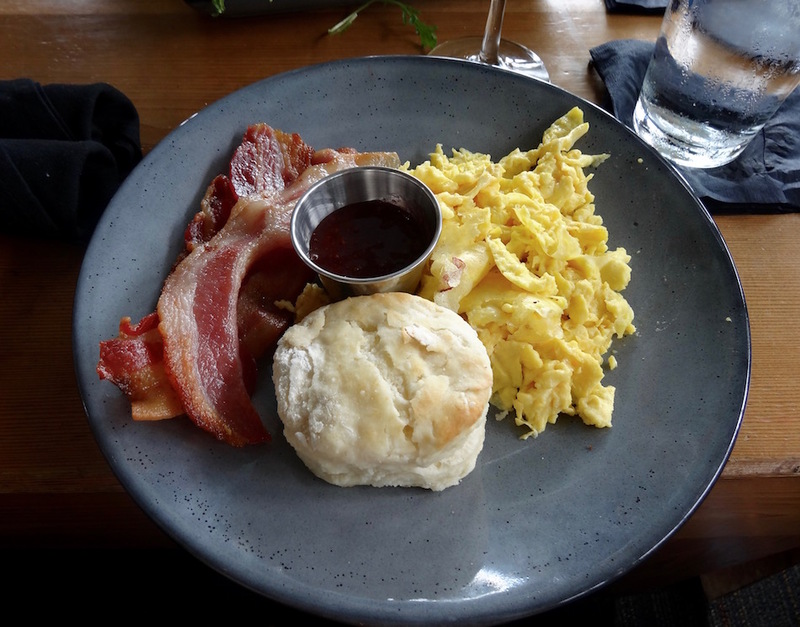 You’ve got to brunch at least once when you visit! Clumpies Ice Cream. So many flavors, and they’re all absolutely delicious. I love their classic cookie dough, but their seasonal flavors are so unique. They had a mint julep ice cream back in the spring that was also pretty divine. Clumpies was even featured on Buzzfeed as the most popular ice cream shop in Tennessee! Chattanooga Symphony & Opera. For a mid-sized city, Chattanooga has an incredibly impressive symphony and youth orchestra. They play September through May at the Tivoli and their repertoire often makes me miss my violin-playing days. Wine Over Water. 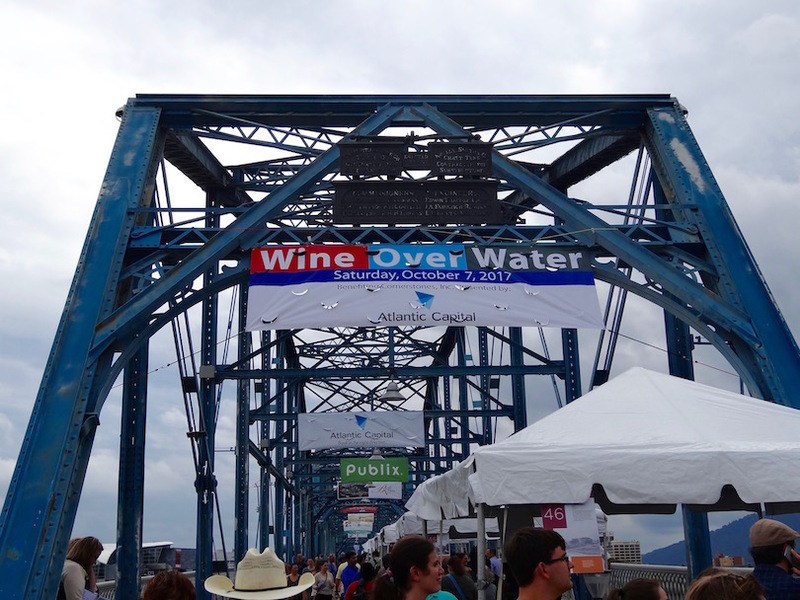 If wine is your thing, then you should definitely consider visiting Chattanooga for this annual wine festival. It’s one of the biggest events in the Southeast for a reason. Startup Week. Every October, the innovation and entrepreneur community comes together to celebrate startups, small business and innovation for a whole week. I’m so lucky to be a part of this community, and Startup Week is something I look forward to every year. Riverbend Music Festival. I will admit that I wish Riverbend had more of a “musical identity,” but regardless, they still bring in some pretty awesome acts each year. In recent years we’ve gotten Thomas Rhett, Sam Hunt, Brett Young, Bret Michaels, Blackberry Smoke, Salt N’ Pepa, Brett Eldredge, Heart, Hawk Nelson, for King & Country, Switchfoot and so many more. Chattanooga Whiskey. These people literally changed the law so they could distill whiskey. And I’m glad they did, because they’ve got a product to be very proud of. You can tour their experimental micro-distillery downtown and enjoy a couple cocktails in their tasting room. Hunter American Art Museum. The art inside is pretty awesome. So is the view of the river off the back of the bluff. One of my favorite events, Handcrafted Wishes, is held at the Hunter each year. Bluff View Art District. As the name suggests, this little neighborhood sits atop the bluff overlooking the Tennessee River. There’s all kinds of cute shops, galleries and cafes, so it’s easy to spend several hours up there. Chattanooga Football Club. 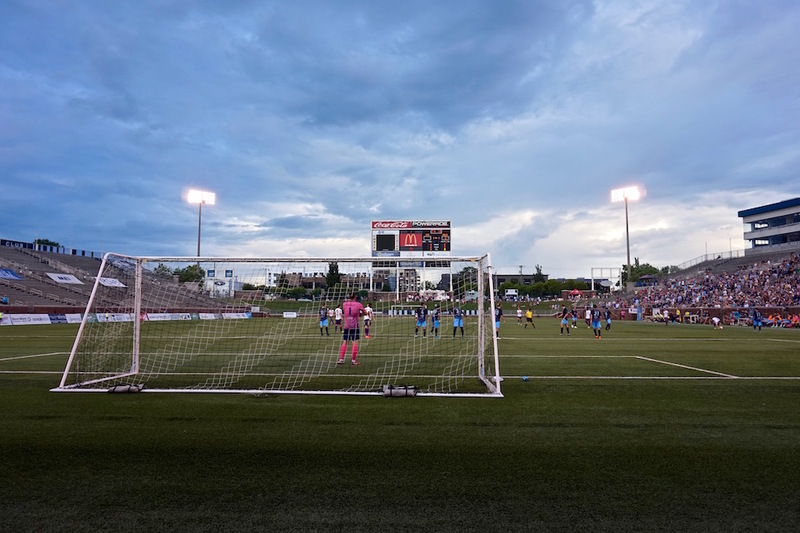 Have you ever seen a city that loves lower division soccer more than Chattanooga? Our club plays in the NPSL, and though our season is short, it’s one of the best seasons in the city. Come to one match and you’ll see why we love our Boys (and girls!) in Blue so much. Renaissance & Coolidge Parks. Running along the north banks of the Tennessee River are two large public parks, which are always crowded on beautiful afternoons. Craft beer scene. Are you a beer aficionado? You’ll love exploring any of Chattanooga’s breweries and tap rooms. There are plenty of places to enjoy a craft beer in town, and you’re bound to find at least one beer you’ll love. Amazing coffee shops. 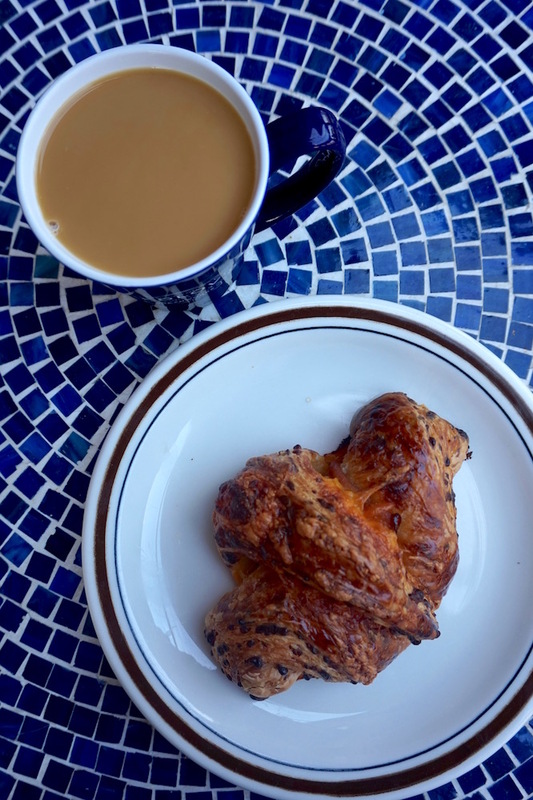 If you love to start your day with a nice cuppa joe or espresso drink, then Chattanooga has some pretty great coffee shops where you can do just that! I’m lucky that several of those places are close to my work, so they’re also great for that mid-afternoon caffeine kick. Songbirds Guitar Museum. Music geeks, this place is for you. It’s a world-class guitar museum that also hosts open-mic nights, various concerts and more special events. Local comedy. Did you know Chattanooga has its own comedy club? The Comedy Catch hosts lots of awesome shows, open-mics, competitions and more. The Palace Theater hosts some pretty great monthly shows, including Chattanooga’s only late-night talk show and all-female comedy showcase. We’ve also got an improv troop! Local music. What’s your taste in music? There’s probably a Chattanooga musician that plays it. We’ve got so much talent in this city and it keeps growing. Additionally, we have a few really great venues—one of which is a Marathon Music Works venue—and a local nonprofit that works to develop the local music scene. Nightfall summer concert series. Free live music and food trucks, all in one place? Come check out Nightfall on Friday nights May through August at Miller Plaza. It’s an easy outing for the family and a great start to the evening for anyone ready for a good night out. 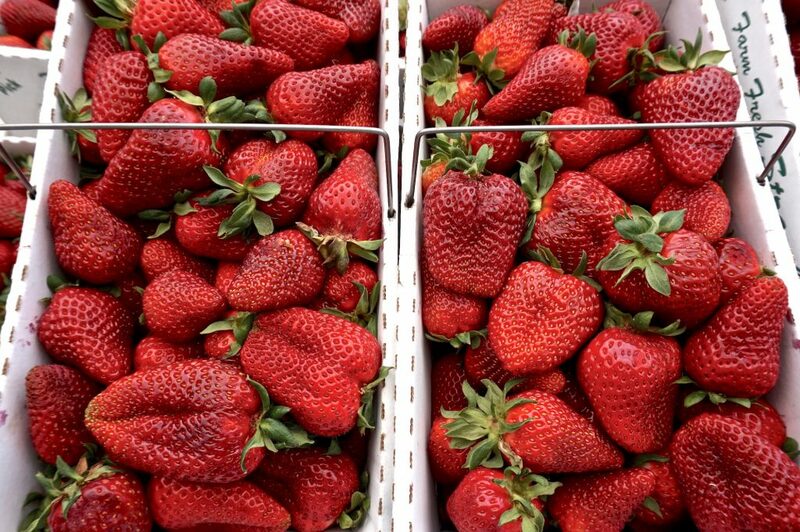 The Sunday farmer’s market. Every Sunday from April through November, local farmers, makers, and vendors set up in the First Tennessee Pavilion. There’s even beer and mimosas! The market is a social event in itself. MAIN x 24. Every year, Main Street shuts down for 24 hours and we have a 24-hour street festival downtown. Many businesses and restaurants along Main Street (and from other areas of town) offer specials and pop-ups. The highlight is the Chili Cook-Off, and it’s exactly what it sounds like. MAIN x 24 is basically a giant party for the whole city. Restaurant Week. Chattanooga is blessed with a wonderful food scene, which we celebrate in July every year, thanks to Chattanooga Magazine. Participating restaurants put together special menus with limited-time meals and drinks. The week wraps up with the Five-Star Food Fight at the farmer’s market. Restaurant Week is one of my favorite weeks of the year. Food, in general. We have a lot of really good food. I won’t beat a dead horse with this one, so check out this post and this post. Historic Chattanooga Choo Choo. Train terminal turned hotel, turned entertainment district! The original Choo Choo train still sits out back in the Glenn Miller Gardens. 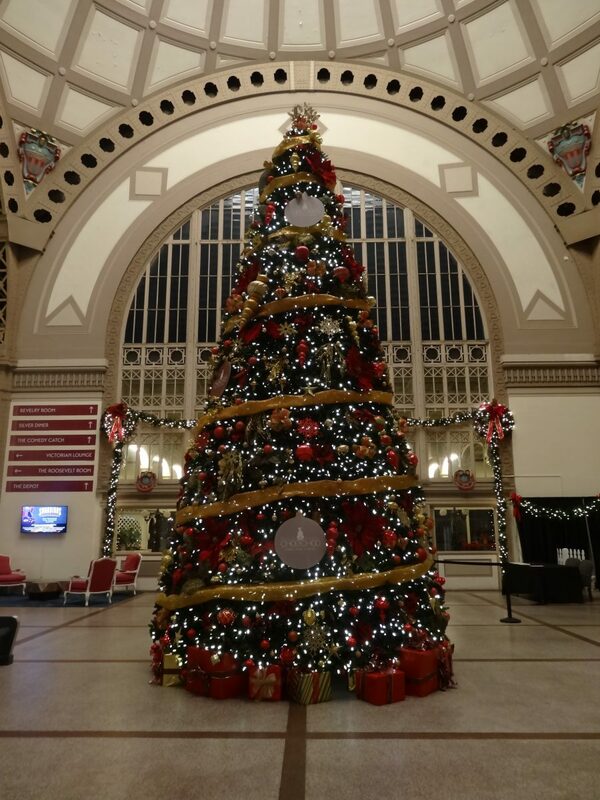 The Choo Choo is especially gorgeous during the holidays! Ruby Falls & Rock City. 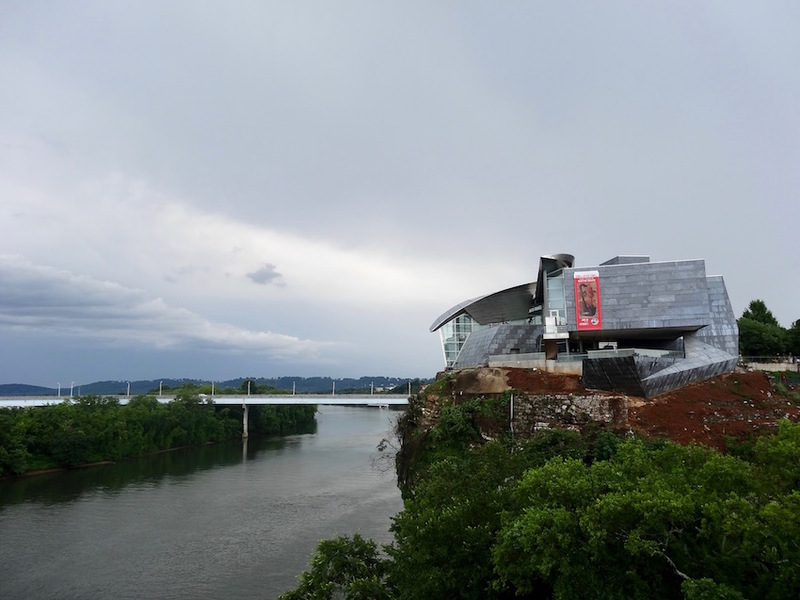 Sure, they’re super touristy, but they’re two big reasons many people visit Chattanooga. Take the Incline Railway up Lookout Mountain and see seven states from Rock City. Then come back down, go underground and see the waterfalls at Ruby Falls. Tennessee Aquarium. It’s been recognized as one of the best aquariums in the country. It was also one of the first places I visited as soon as I moved here. We have lemurs now! And some really cute river otters. And PENGUINS! 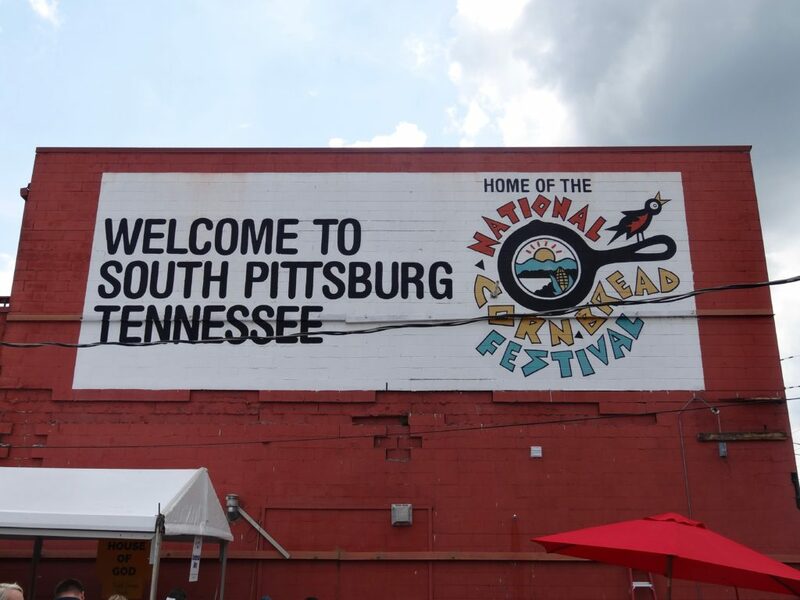 National Cornbread Festival. Okay, it’s a little bit outside of Chattanooga (about 40 minutes west, in South Pittsburg), but it’s one of the best events in Tennessee. It’s literally an entire two-day food festival devoted to cornbread. What else does a Southerner need?! Chattanooga Lookouts. If lower-division soccer isn’t your thing, check out our minor-league baseball team. The Lookouts play April through August at AT&T Field, and tickets are super cheap! They do fireworks on most Friday nights, so it’s a great night out for the family. Head of the Hooch regatta. Watch hundreds of rowers and crew teams race down the Tennessee River in the annual Head of the Hooch race. It’s quite a spectacle! Chattajack SUP race. One of the coolest experiences and sights in the Scenic City—a 31-mile stand-up paddleboard (and kayak and canoe) race down the river. It starts at sunrise right below the Market Street Bridge and it’s just one of the prettiest sights I’ve ever seen. Walnut Street Pedestrian Bridge. If you’ve Googled anything about Chattanooga, chances are you’ve seen a photo of our Walking Bridge. It’s an icon of the city, and it’s one of the longest pedestrian bridges in the country. The Dwell Hotel. Probably one of the most Instagrammed locations in the entire city. The Dwell is a beautiful little hotel—each room has its own theme and decor. It’s also home to Matilda Midnight and The Solarium, two great little restaurants and bars that are just as Instagrammable as the hotel itself. 4 Bridges Art Festival. Every April artists from the area and beyond come together to share (and sell) their work with the Chattanooga community at 4BAF. It’s fun to browse and admire others’ talents for a few hours on a nice spring day. Chattanooga Zoo. For a mid-sized city, Chattanooga has a pretty sweet zoo! It’s perfect for families and animal lovers alike. They even have red pandas and meerkats! Creative Discovery Museum. Again, this is a great rainy day activity for families with kids. It’s full of hands-on, interactive activities to encourage kids’ creativity and innovation. 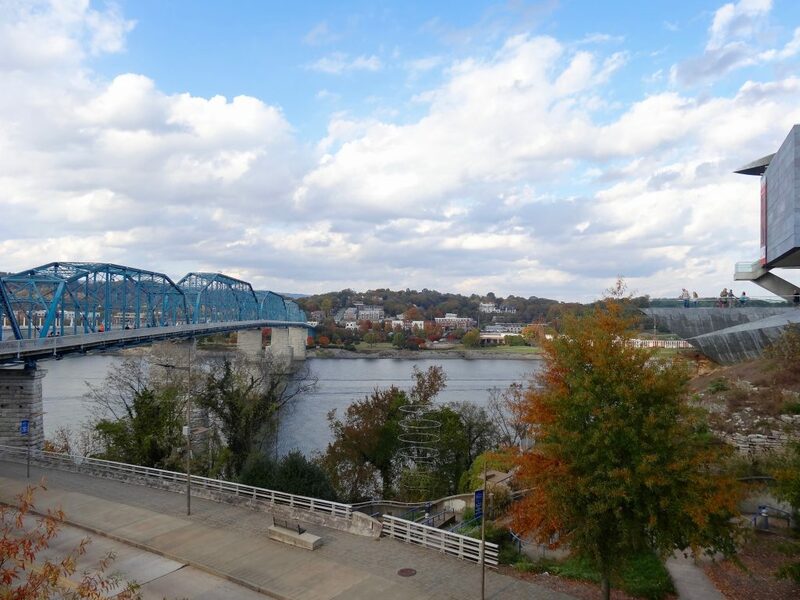 All of these are wonderful reasons to visit Chattanooga. But if you ask me, the absolute best reason is that it’s just full of Southern charm and hospitality. I rarely meet someone I don’t like, and 9.9 times out of 10, you’ll be greeted with a friendly smile and “how can I help you?” It’s pretty fabulous. If you’ve never been here, I hope you’ll make plans to visit Chattanooga sometime soon. I promise it’ll be a visit worth your time, energy and effort! After all, I’ve been here for three years and I can’t picture myself leaving any time soon.